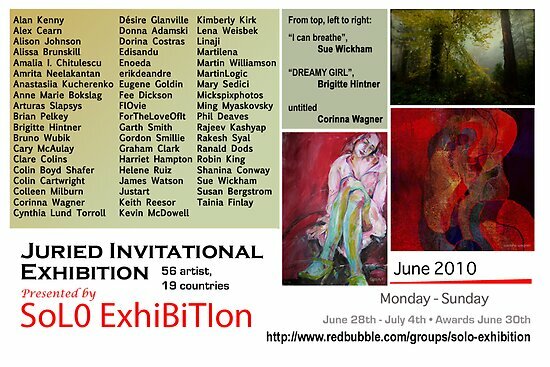 Today, Monday, June 28, 2010, marks the start of only the fourth Juried Invitational Art Exhibition sponsored by Solo. Yet, it seems, already, that these events, called “SoJie”, for short, are an inherent and deeply meaningful part of history, here on RedBubble. Maybe it’s because there are 56 – 59 fine, traditional artists, photographic artists, and digital artists participating each month; maybe partly because the exhibitors bring such variety and experience to their work, having lived or worked in 19 or so countries, collectively; or perhaps because the internet makes a great place to showcase art in a gallery style setting, without walls. Possibly, in part, it’s because we celebrate loud and hardy, afterwards. Receptions start out modest and respectful like any art gallery opening night; but as the week builds, and artists and friends get fuller on virtual grapes and pizzas and full spreads of Chinese and Italian dinners, not to mention fantastic desserts; and inebriated on virtual bubbly and cosmos, it gets a little rowdier. All in all, we are celebrating art and artists. The official Nominators for this show, Jan Piller, Linda Ridpath, and Vasile Stan, have done an outstanding job. The Judges have had their work cut out for them. But their jury duty is over now; yes, the results are in, so I can name names. Our Jury panel was made up of Joanne Bradley, Elizabeth Bravo, and Lior Goldenberg, each having expertise in at least one of the three categories of digital art, photographic arts, and traditional art. Awards day is Wednesday. You’ll want to preview the show before the big day, and see which ones you would choose, if you were a judge. By the way, both Nominating and sitting on the Jury panel are a great way to help build a discerning eye toward 3rd party art. Exhibitions are a way of life for successful, professional artists, and a goal for the rest of us. 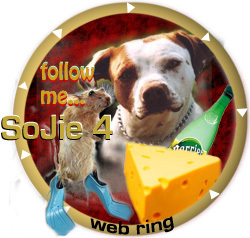 You are invited to the show: SoJie 4, and you are welcome to comment! We will have a web ring going as soon as tonight, so if you cannot leave a comment on the show (not a Solo member, in other words), then look for these announcement journals from participating artists. If you do not belong to the group, Solo Exhibition, you cannot participate in commenting; and joining to comment is not encouraged. But you CAN lend support by commenting in my journal, here, about the show. The webring will be small at first, and will grow to about 45 or 50 people strong over the next few days, so “keep on trucking”! Thank you, Isa. What a grand show. The art is just superb. I’m so pleased for each one of these artists. And I’m so excited to be up there ☝and in the exhibition!!!!! I’m excited for you, Robin. Well done! What an outstanding display of BRILLIANT artwork! Thanks, Alissa. It’s good to have your work represented in SoJie, again, for this one. Congrats! Ahhhh Here i am in the ring of joy!!!! Great Exhibition Frannie the art is incredible! It IS incredible, and YOURs helped make it that way! This looks Fabulous Frannie. It is always so exciting to see the nominees and follow their progress as the results come in. Great banner too and I love the Web Ring!! I enjoy it as it gets bigger and bigger and bigger. It is fun. Thanks, Anna. We do have such a beautiful slate of artworks for the show. One ring-y ding-y, two ring-y ding-y…..
Heheee, I’m about to go put some more space between us, Robin. Landscape mode on iPad Cases - buyers' choice?